Now that you have started orthodontic treatment, here are a few hints to help get you through the first several days with a minimum of discomfort. There might be a general soreness in the mouth. Rinsing the mouth with a warm salt-water mouthwash can relieve this. Dissolve one teaspoon full of salt in 225 ml of warm water, and rinse your mouth vigorously. If the tenderness is severe, take paracetamol of whatever you normally take for headache of similar pain. Soreness should end by the third or fourth day. This is to be expected throughout treatment. It's normal so don't be upset. 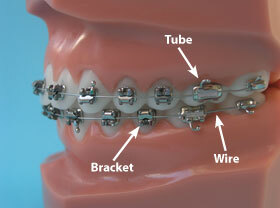 The teeth will, after orthodontic treatment, become rigidly fixed in their new position. Teeth must loosen first so they can be moved trough the bone. 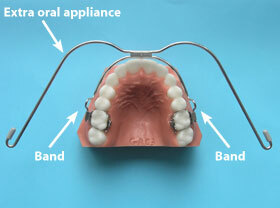 Be careful to protect the orthodontic appliances when you eat. Faithfully follow our instructions on foods to avoid. For the first day or so, soft foods will be more appropriate. Avoid candies, tough meats, hard breads, and raw vegetables plus any other specific foods we find can cause problems. If you take part in sports, it's important that you consult us for special precautions. In case of any accident involving the face, check your mouth and the appliances immediately. If teeth are loosened or the appliances is damaged, phone at once for an appointment. In the meantime, treat your discomfort as you would treat any general soreness. continues, place wax or wet cotton on the wire to reduce the annoyance. and repair the appliances. If any piece comes off, save it and bring it with you to the office. As a general rule, an emergency appointment may be made when there is severe pain, a loose band, a broken wire or something sticking out that you can't take care of. It's important to know the names of the parts of your appliances. It will help, when you phone the office, to be able to identify what part is broken or out of place. Refer to the pictures on the back of this pamphlet. Success of treatment depends upon cooperation between you, the doctor and staff. Wear the appliances as directed, avoid the foods that can be damaging and handle emergencies promptly. Always be conscientious and responsible toward your treatment. Quick, successful results depend on you, too. It's very important that you keep your teeth, gums and appliances clean. At least once each day, spend a few moments with a mirror checking the appliances to make sure they are thoroughly clean and in good shape. Always smile and be proud of your appliances. After all, it shows the world that you take very good care of yourself.